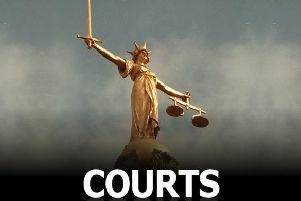 A Lincolnshire man who admitted a charge of child abduction was given a three year community order by a judge. Jordan Gill, 21, was found in a disabled toilet in Coningsby with the under age girl after she went missing from home, Lincoln Crown Court heard. The court was told Gill had ignored an abduction notice served on him by the police which prevented him from having any contact with the girl. Jonathan Dunn, prosecuting, told the court when police analysed Gill’s phone they also found 61 indecent ‘selfie’ type photographs which the girl had taken of herself and sent to him. Mr Dunn said Gill saved the images on his phone and also admitted kissing the girl. Messages on the phone referred to the pair as ‘boyfriend’ and ‘girlfriend’, and Gill had listed the girl in his contacts as ‘my little shorty’. Gill, of no fixed address admitted a charge of child abduction. He also pleaded guilty to offences of sexual activity with a child and making indecent images of a child between April 20 and May 19, this year. David Eager, mitigating, told the court Gill had been on remand in prison since May and already served the equivalent of a 12 month sentence. Mr Eager said: “The victim was only away from home for a matter of hours. Mr Eager added that Gill was an immature 20-year-old at the time of the offences and needed treatment. Gill was sentenced to a three year community order and must complete a sexual offenders treatment program. He was also made the subject of a Sexual Harm Prevention Order for five years. Passing sentence Recorder Simon King made it clear Gill would have received a custodial sentence if was not for the time he had already spent on remand.